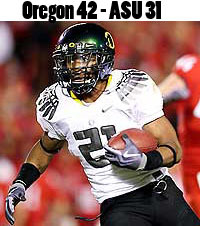 During the 2010 NCAA Football season, the University of Oregon football team has worn 12 different uniform combinations created by Nike. Last week, Nike released the most important combination of the season, that being the one the Ducks will dawn during their BCS National Championship match-up versus Cam Newton and the Auburn Tigers. 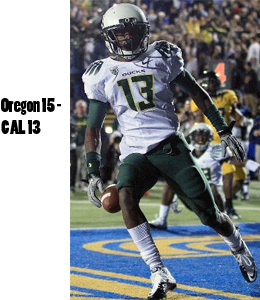 The 13th and final uniform features a combination of various aspects from the previous 12 uniforms worn by the Ducks during the team's 12-0 run to the BCS title game. 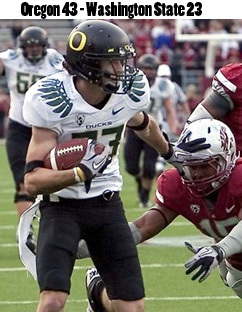 The BCS uniform was one of literally hundreds of combinations that Nike CEO and mega-booster Phil Knight chose from for the Ducks date with destiny. 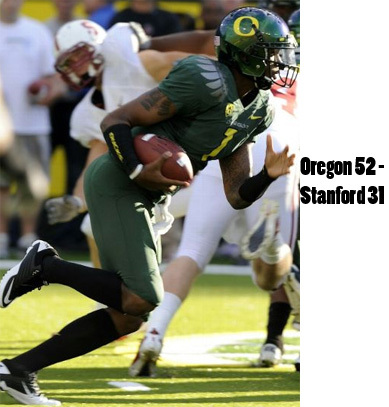 Knight's alma mater is Oregon, thus he wanted to make sure his team wore threads worthy of the biggest game in the history of University of Oregon football. The uniforms were unveiled last Tuesday during a presentation at Cowboys Stadium. 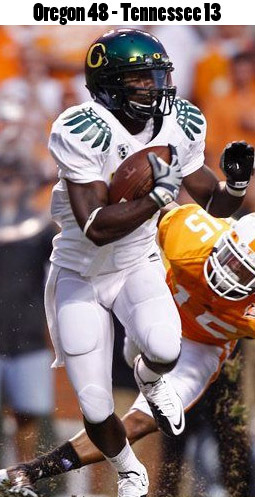 Knight and his crew of creators were a bit limited due to the fact that Oregon was designated as the "away" team for January's BCS title game, which forced them to get creative with the plain white jerseys. "Carbon" helmets the team wore against Portland State. 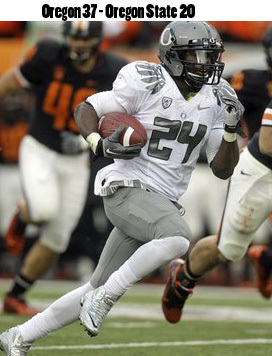 The white on white pants and jersey combo worn during the team's victory over USC. New bright yellow piping around silver numerals. 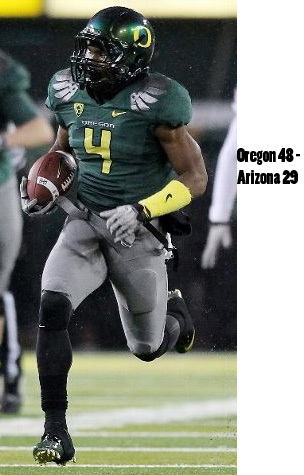 When held together, the palm of the gloves reveals an Oregon "O". 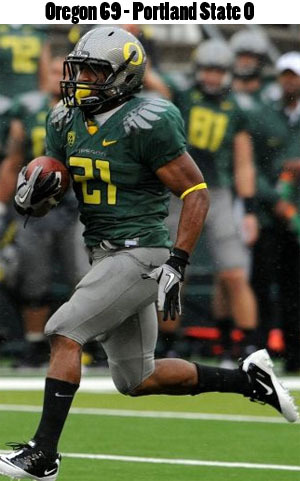 Oregon's Nike uniforms will take the field on January 10th, 2011 when LaMichael James, Chip Kelly and the rest of the Oregon Ducks take on Heisman Trophy winner Cam Newton, Gene Chizik and the undefeated Auburn Tigers in the 2011 BCS National Championship Game in Glendale, Arizona. The Auburn Tigers will be wearing a new pair of cleats designed by Under Armour. 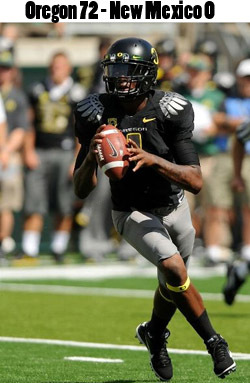 Below is a gallery of every Nike Uniform worn by the Oregon Ducks during the 2010 NCAA Football Season. Really enjoy reading your website. As someone who recently got back into the hobby I enjoy the insight and opinion the site has on both old and new products. After some recent denials of redemptions by both UD and Topps (2008 & 2009) products I am hoping you can energize your followers with complaints. I can’t believe these companies have been able to get away with not honoring redemptions even after the expiration dates (which are getting shorter). Keep up the good work. @Steve Burnite: thanks man, it’s comments like that that make this all worthwhile. I will look into your redemption situation as soon as I have a minute, if I forget remind me with a message. really? its football not a fashion show pick 2 unis and stick with em. i hope the tigers pwn oregon even though I’m a BAMA fan. I just want to mention the misspelling of the word dawn instead of don in the second paragraph of this article. OOOPS. Unless I am wrong, but the spelling doesn’t fit the sentence at all. And, too, I wish they would wear the old OLD colors of medium to dark green and yellowish-gold. I mean, isn’t that our school colors? Please let Phil know. Thanks! All I have to say is that Phil Knight, CEO of Nike, has absolutely the worst taste and lack of any sense of “cool” that I have ever seen. I guess he must be forgiven by the school’s administrators since he has donated so much to his Oregon Alma Mater, but the hosts from “What not to wear” need to abduct him.